Put and hold one 1/4 dropper under your tongue and notice how it tastes. Continue putting 1/4 droppers in, until the bitter taste becomes almost 100% sweet like honey. You have now taken the perfect dosage for your body for that day. If after five minutes you still desire additional effects, then repeat steps 1-3. Because of our bioavailability, our product is at least 20 TIMES MORE POTENT THAN REGULAR CBD. Do not exceed 8 droppers in a day unless directed by your health practitioner. CBD has an inverse effect, which means you’ll become more sensitive to the CBD effects as use continues, and you will need less for the same results. After 1 week of usage, you can start at step 2. CBD has multiple curves of efficacy— the ability to produce a desired or intended result. The optimal dose is balanced in the middle of the curve. 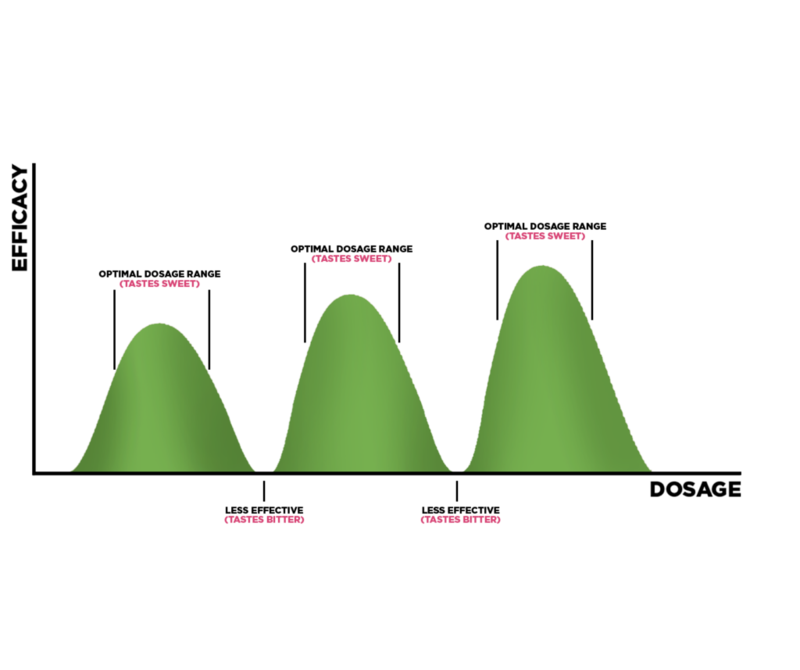 For each sequential sweet tasting dosage peak, the higher you go within the optimal dosage range, the more systems it will balance. It will change from bitter to sweet when you go up and down the curves of efficacy, you always want to end when it tastes sweet, and not when it tastes bitter. Most users find that 2-3 droppers is their optimal dosage range at the beginning. Please also note that CBD can act like grapefruit in regards to interacting with some prescription medications. Put It In The Tub! Put 1-6 droppers in a bath for a spa day and massage rolled into one. Our water soluble tech lets it absorb easily to nourish your entire body. It is quite life changing. Putting a couple drops to droppers in your smoothie is an awesome way to get a boost of all the nutrients from our elixir. Erewhon's hemp drinks are made exclusively with our elixir and are their top selling drinks for a reason. Put It In Your Coffee! A few drops of Ojai CBD in your Coffee can balance out any coffee jitters and make for a better experiene! Have fun experimenting with the most versatile CBD on the planet! From salad to dessert, Ojai CBD will take your food to the next level!